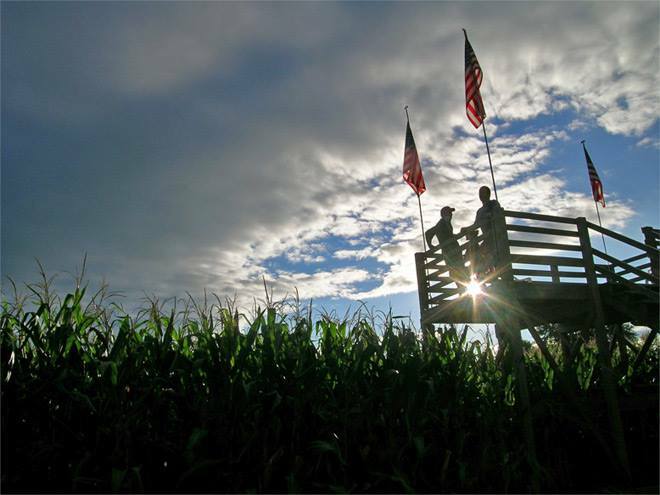 Mike’s Maze is a family entertainment destination featuring our 8-acre corn maze! Visitors to Mike’s Maze will encounter activities, games, and amusements to entertain the entire family. Located on a working farm at the foot of Mount Sugarloaf, visitors enjoy gorgeous views of the New England foliage. It is a unique experience for a fall-time visit to the farm. Every year we concoct a brand new maze, along with a themed game that will challenge you to solve puzzles and problems, and lead you on your exploration through the corn! While you’re here, you can take part in our many Attractions; a ride on a horse drawn wagon, ride a pony at our petting zoo, pick out your own Halloween pumpkin, and stay for lunch at the Corn Cafe, serving farm fresh food all day. For younger kids, we offer daily activities and games at Mike’s Mini Maze. Older kids (and adults!) can enjoy our brand new pedal carts at Dave’s Derby. And folks love to check out the view of the maze from the perspective of our giant walk-in kaleidoscope! Mike’s Maze hosts a variety of Special Events during the season, most notably The Kitchen Garden’s Chilifest!, a spectacular two-day event celebrating all things spicy. “Best Corn Maze in the U.S.” by Yahoo News! The idea for Mike’s Maze was born at a Christmas party almost twenty years ago when two friends, farmer Mike Wissemann and artist Will Sillin, decided to combine talents and create corn art. Will designed the inaugural maze and fashioned it using a rented ATV and a GPS. After the first year was a success and they decided to make each maze bigger and better than the last. Will has since created a precise strategy to perfect his corn art by creating a grid system and removing individual stalks of corn for greater detail and precision. After a decade and a half of making his world famous art in corn at Mike’s Maze, and designing creative games to pair with them, Will has stepped down as our Resident Corn Artist in order to spend more time exploring his other areas of artistic interest. After many long conversations with Will about technique and style, logistics and creativity, Mike’s son David Wissemann and his wife, Jess Marsh Wissemann will design their first maze in 2015. Mike’s Maze is more than just a corn maze–each year it is an original masterpiece of corn art on earth! Really, it’s true. Just take a look at our Past Mazes and be amazed!